I want to set the origin/pivot point of a multi mesh character to the feet of the character. I tried making an empty object as the parent to all other objects (and armature) of the character and have this empty objects origin in (0,0,0), but when importing to Unity the charcters origin/pivot point is still in the center of the character... Any ideas/solutions? The problem also can be in Unity. 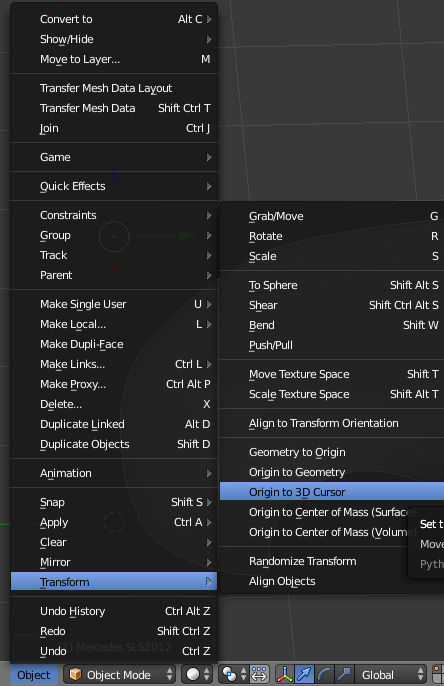 Set the origin of your armature object. Don't have unity to test atm, (not since I quit windows for ubuntu) but IIRC the origin is the origin of the armature object. Now this is going to mess up the location of all children. In the case above I have selected the cube (it's the "body" of the armature for example sake) and clear the parent inverse to move it back. AltP Ckear Parent Inverse. This however may depend on how the mesh objects were positioned as children to the armature. in which case selecting and translating is another option. Also to move all meshes as well to have new origin as origin follow @FFeller's answer for meshes and clear parent inverse. Not the answer you're looking for? Browse other questions tagged modeling export unity origin or ask your own question. How can I set the object origin for an armature? How do I reset the transforms of an object to the original values?